This article was originally published on Seeking Alpha. Disclosure: I am long SCHB, SCHD, SCHF, DEM, SCHZ, LQD, HYG, SCHP, SCHH, IAU, AMJ, VQT. I wrote this article myself, and it expresses my own opinions. I am not receiving compensation for it (other than from Seeking Alpha). I have no business relationship with any company whose stock is mentioned in this article. This approach uses commission-free ETFs to provide low-cost, flexible exposure to stocks and bonds. This approach also uses nontraditional assets such as gold and real estate for inflation protection, as well as alternative mutual funds for volatility management and hedging of tail risks. This blend of assets and strategies creates portfolios with high transparency and tax efficiency, and it facilitates cost-effective rebalancing. Sources: Charles Schwab, Envestnet, Right Blend Investing, LLC. First of all, the portfolio above is an illustration, and not arecommendation. (I don’t want to get sued, thank you very much.) This illustration is based on a model portfolio used at Right Blend Investing, but the illustration above does not include our firm’s current tactical bets. Instead, the focus of this article is on the investment process used to create a mini-endowment. Thus, this article focuses on the portfolio’s baseline allocation, its strategic tilts, and the benefits for investors. This illustration uses products from Charles Schwab, though investors could build mini-endowments at Fidelity and TD Ameritrade. These firms offer different commission-free ETFs representing the major asset classes, so the model portfolios have different securities. For the sake of brevity, this illustration focuses on one platform, and we chose $100,000 as the initial investment. This portfolio is designed for an investor with a moderate tolerance for risk and a time-horizon of 10 years or more. It is designed for an IRA or other tax-deferred account with assets of at least $100,000. This ensures that the positions will meet the account minimums for each of the mutual funds held in the portfolio. A similar model can be used for accounts as small as $50,000, though it would not include exposure to certain alternative mutual funds because of the required minimum investment. The benchmark for this portfolio is a 60/40 blend of stocks and bonds. The exact mix is 43% in the Russell 3000, 40% in the Barclays Capital Intermediate U.S. Government/Credit Index, and 17% in the MSCI EAFE. This is the default benchmark for moderate risk on Envestnet, the trading platform used by my firm. As of April 4, 2013, this portfolio had a current yield of 2.5%. This modest yield reflects its defensive characteristics, since the portfolio is not designed for retirement income. 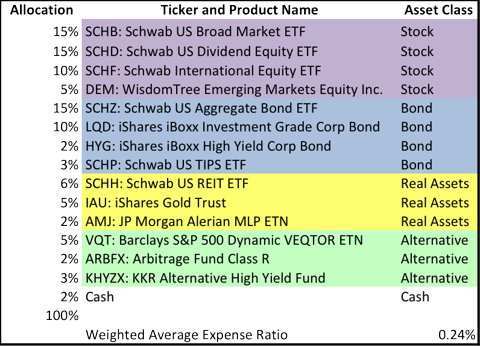 The model portfolio has a weighted average expense ratio of 0.24% at Charles Schwab, which Right Blend Investing uses as our primary custodian. (Investors can imitate this model portfolio at Fidelity and TD Ameritrade, though our research indicates the expenses are higher. Details are available upon request, if you ask politely.) In addition to the 0.24% expense ratio, clients also pay 0.10% in platform fees to Envestnet, and an additional 1.0% fee to Right Blend Investing, as described here. · Alternatives: Overweight private equity/Underweight unconstrained global macro. These alternative funds were chosen for exposure to volatility (VQT), merger arbitrage (ARBFX) and a private equity approach to high-yield debt (KHYZX). Due diligence was done by Right Blend Investing based on information from Charles Schwab, Envestnet, Morningstar, and fund prospectuses. Many institutional investors use an endowment model that includes real assets such as gold and commodities, as well as hedge funds and private equity. These nontraditional strategies are now available in mutual funds and Exchange Traded Funds (ETFs), so the endowment model has become feasible for investors with portfolios of $100,000 or less. 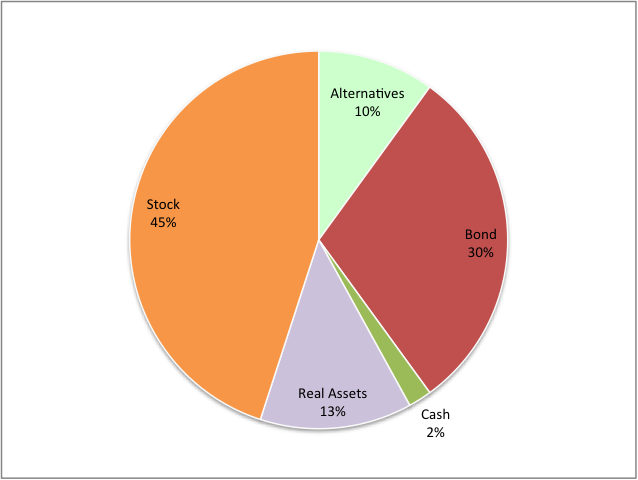 The asset allocation shown below allocates 13% to real assets and 10% to alternative strategies. Many endowments have much higher allocations to both real assets and alternatives, and the suitable mix will depend on the goals of the investor and the current market outlook. 1. Risk: Volatility is tolerable, but loss of principal or loss of purchasing power is not. 2. Diversification: Investors should consider broadest possible range of strategies to build portfolios. 3. Alternatives: These are used to reduce correlations, hedge tail risk, and to seek alpha. 4. Beta: Investors should aim for efficient exposure to beta. 5. Long-term: Investors should focus on the long-term investment process, rather their short-term investment results. · Low Expenses: Commission-free ETFs from Charles Schwab keep expenses low, even thought some of the mutual funds have expense ratios well above 1%. According to Envestnet, the portfolio above has a weighted average expense ratio of just 0.24% as of April 4, 2013. 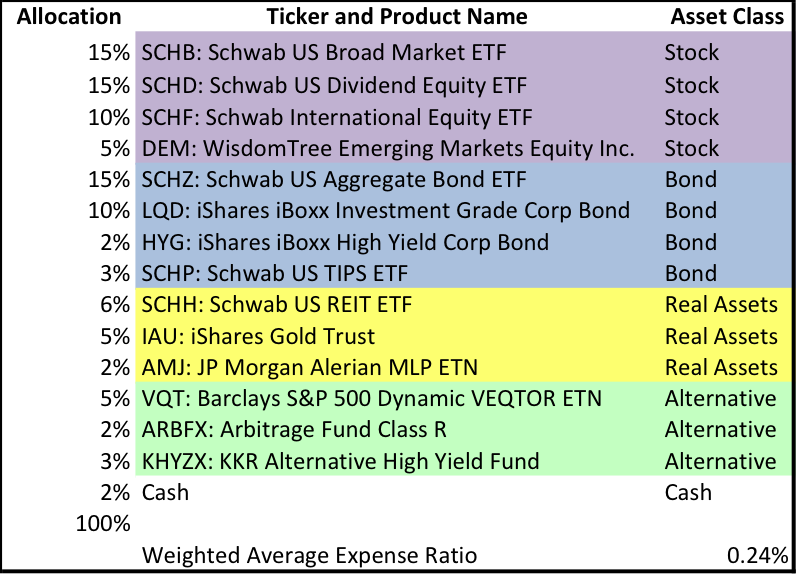 · Simplified Rebalancing: This portfolio allows investors to rebalance small portfolios frequently, using the commission-free products from Schwab. In this model portfolio, we use the low-cost stock and bond positions to make tactical and strategic changes in asset allocation. As a general rule, we trade our passive funds, and we leave our active funds alone. This approach provides liquidity and tactical flexibility, without interfering with the actively managed funds. · Tax Efficiency: The mini-endowment approach can also be used in taxable accounts, and the combination of ETFs and mutual funds makes it quite suitable for tax-loss harvesting. · Inflation Hedging: Real assets such as gold and commodities provide a hedge against inflation, and have historically had a low correlation with the stock and bond positions. In addition, real assets such as REITs and MLPs can be an attractive source of income in a zero-rate world. · Volatility Management: The alternative assets (and some of the real assets) provide a valuable hedge against all sorts of economic shocks and market meltdowns. Historically, investors would use bonds in this role, since they have had a low correlation to stocks. But since 10-year U.S. government bonds offer negative real returns, and since Right Blend Investing has concerns about the outlook for inflation and interest rates, we prefer to use other assets for volatility management and tail risk hedging. Looking ahead, we plan to provide additional details about asset allocation and security selection in future articles. Your feedback is welcome. Additional disclosure: All written content is for information purposes only. Opinions expressed herein are solely those of Right Blend Investing and our editorial staff. Material presented is believed to be from reliable sources, however, we make no representations as to its accuracy or completeness. All information and ideas should be discussed in detail with your individual adviser prior to implementation. The presence of this article shall in no way be construed or interpreted as a solicitation to sell or offer to sell investment advisory services to any residents of any State other than the State of New Jersey or where otherwise legally permitted. This is not a complete discussion of the information needed to make a decision to open an account with Right Blend Investing, LLC. There are always risks in making investments, including the investment strategies described.